One of the world’s oldest inhabited places, Patna consists of a lot of Archaeological sites. “Bihar Archaelogical trip” includes most popular archaeological sites in bihar like Patna Museum, Bihar Museum, Golghar, Kumhrar, 7 Rock Cut Caves of Mauryan Era, Siddheshwar Nath Temple, Mahabodhi Temple, Archaeological Museum, Dungeshwari Caves, Patharkatti, Vishnupad Temple, in Bodhgaya. The Barabar Caves are the oldest surviving rock-cut caves in India, mostly dating from the Maurya Empire, some with Ashokan inscriptions, located in Makhdumpur Block of Jehanabad district, 24 km north of Gaya. Kauva Dol is the name of a hill about 4 Kilometers south-west from the Barabar Hills and about 12 Kilometers east from Bela Railway Station. The name literally means "crows swing," which, it is said, is derived from the fact that a huge block of stone was once lying so well balanced on the existing pinnacle of the hill that it used to rock when a crow alighted on it. 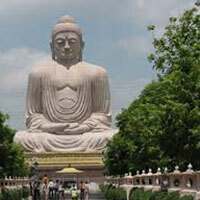 Kauva Dol Hill to Bodh-Gaya– 40 kms (45 Min)Meals & drinks other than specified in inclusions. Arrive at Patna, on arrival Visit our Tour representative will assist you in getting transferred to your car. Then get driven to hotel for your smooth check in. Later drive to Kumhrar Park, Golghar, Bihar Museum and Patna Museum for visit of archeological remains of Stone, Wooden and Metal sculpture of ancient era. In Evening back to hotel, enjoy delicious dinner and for overnight stay. Today after early breakfast check out from hotel and get driven to Barabar. Barabar is world famous tourist place which attract tourist from all over the world for Archaeological Interest. Start guided tour of Barabar Hills, visit the world-famous seven rock cut caves of Mauryan Era. 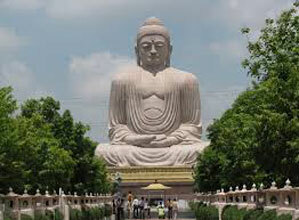 Reach Bodhgaya and check in to you hotel, relax for few hours. Evening proceed to Mahabodhi Temple, a magnificent visit of Temples and place associated with Lord Buddha life. Later drive back to hotel, enjoy meal and stay overnight. After breakfast check out from hotel and drive to Patna. En-route visit Vishnupad Temple and Museum in Gaya Town. Afternoon reach Patna, on arrival drop off you at Airport or Railway Station for your further journey to home.